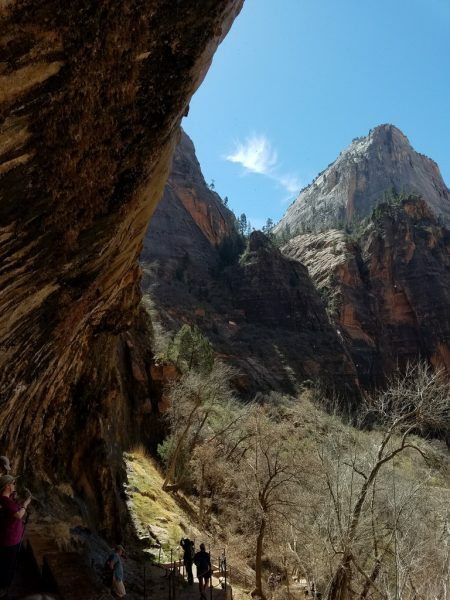 Zion National Park was our first stop on a two week hiking trip through Utah. 2 First, Know the Shuttle System! 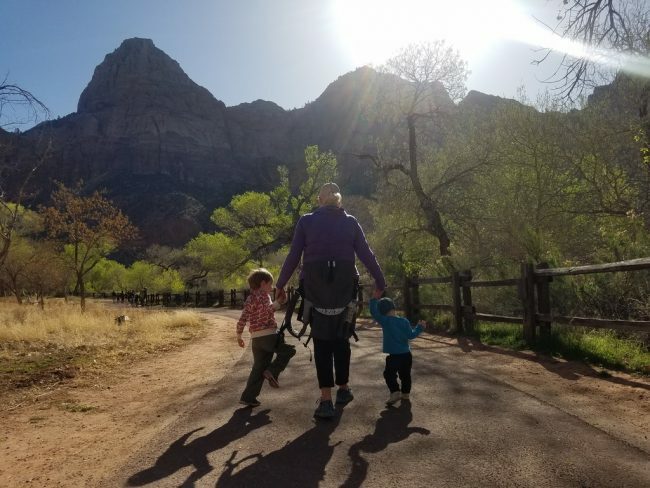 We began our epic hiking trip through Utah’s parks by first visiting Zion National Park after a 2.5 hour drive from Las Vegas. Las Vegas is a good entry point for Utah because the flights are cheap and navigating the terminal and car rental is easy. 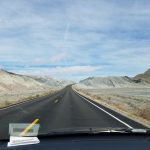 Getting to Zion from the airport means driving through the middle of Las Vegas, but we used the opportunity to stop at a supermarket along the way to pick up some supplies. Alternative points of entry include flying into Salt Lake City and driving (about 6 hours) or flying into St. George. St George is close, but it’s a small airport and flights and rental cars are limited and expensive. 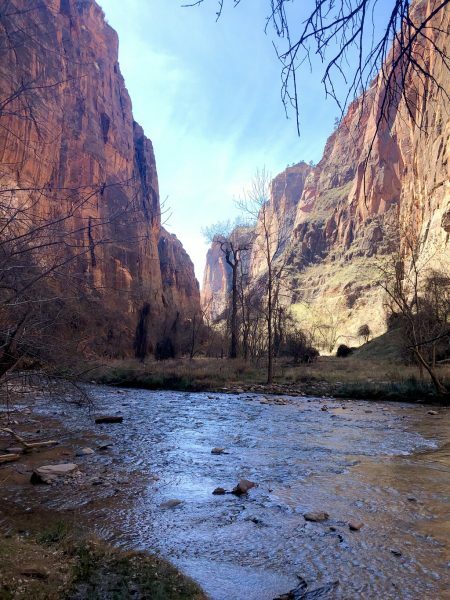 Utah is full of amazing parks, but Zion is by far its most popular. 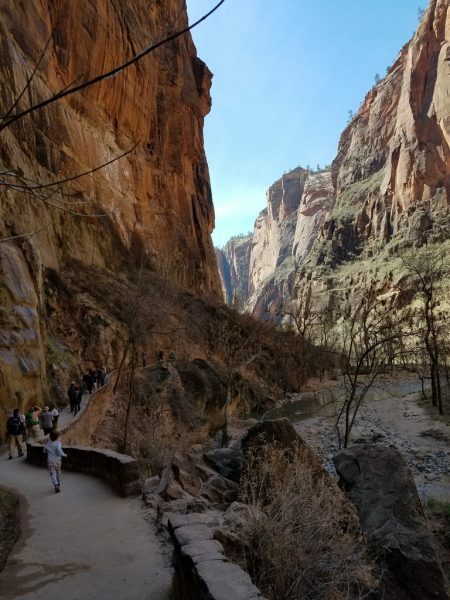 Zion National Park is a world-famous destination, with towering sandstone cliffs, deep canyons and a variety of fantastic hikes. 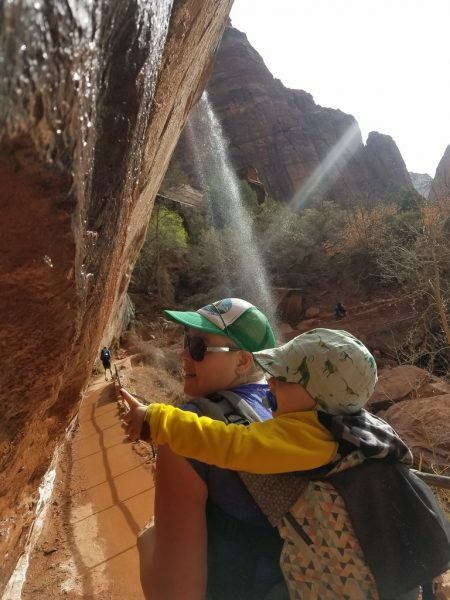 I had been to Zion years ago in my 20’s on a rappelling trip, but with a three-year-old and one-year-old in tow we knew the experience was going to be much different. I’m glad to report the park has plenty to see and do with kids of any age. First, Know the Shuttle System! We arrived late in the afternoon to Zion and decided to get settled for an early start the next day, rather than force a late hike. 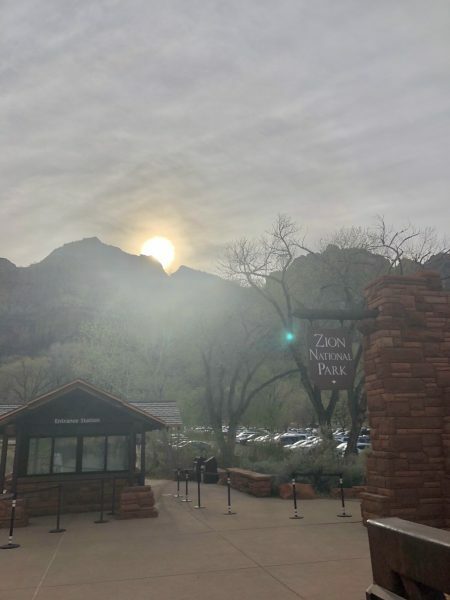 For those who have never been to Zion, the park has a single point of entry and most of the park is only accessible by using the free Zion shuttle during the tourist season. The result of this design is a parking lot at the entrance that fills up quickly by late morning and satellite parking lots further away in Springdale. Once the main lot is full, people also start to park alongside the street leading up to the park so traffic can get messy and slow by late morning. Hold on if you are standing on the shuttle! There is a convenient in-town shuttle that runs along the main road to the entrance, and it’s the best way to get in the park if you are staying at a hotel along the main road of Springdale. 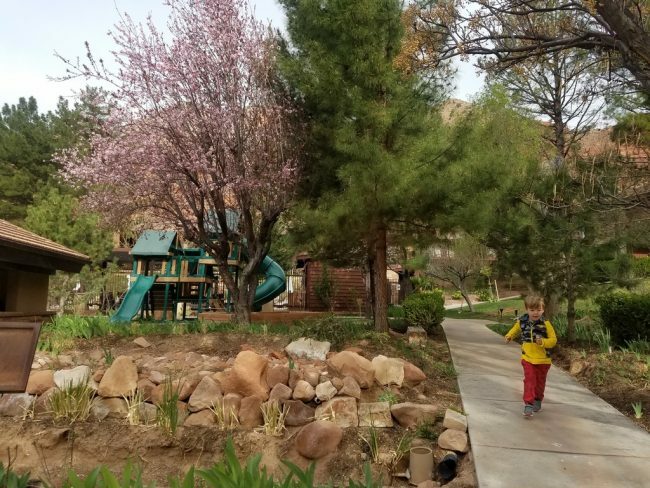 We stayed at the Cliffrose Lodge & Gardens which we were happy to discover is the closest lodging to the park, outside of the campground. This allowed us to walk right into the park without spending any time and energy waiting for the town shuttle or trying to find parking. If you stay at a nearby hotel, check the distance from the hotel to the entrance of the park because it matters! Walking distance to the park is ideal, but as long as your hotel is along the path of the in-town shuttle you can avoid the parking lot chaos. For a sense of timing, the park starts to get busy and the lots start to be full by 9 or 10 am. We still saw people streaming into the park on our way out around 3 or 4 pm, so waiting til late afternoon might be a good idea but we never tried it. If this seems like a lot of information about the shuttle system, it is because the Zion shuttle becomes a huge time sink as the day creeps on. At 7 or 8 am, you may wait about 10 minutes to get on the shuttle. By 9 am, it might take a half hour and by 9:30 or 10 am you are looking an hour or more in line. Once on the bus, it takes a full hour to reach the last stop. Do not get off at the 3rd or 4th stop if you intend to continue further later in the day, because the outbound shuttles will be consistently full and you won’t be able to get back on one without returning to the entrance. A better strategy is to take the shuttle to your furthest stop of the day and work your way back down to the entrance. Our first day started early (in the park by 8 am), so we avoided most of the hassle naturally. 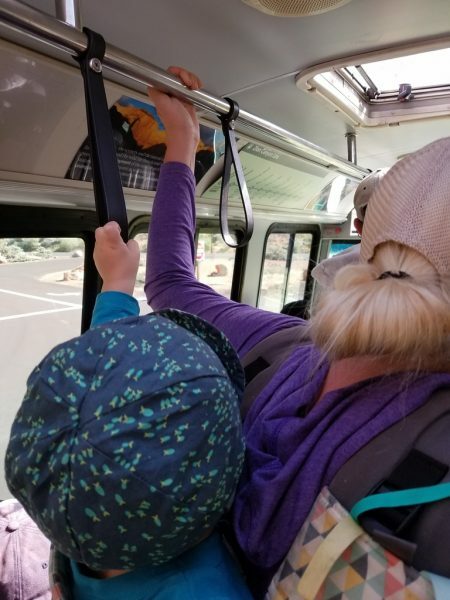 We went to the 5th stop of the shuttle to start our first hike in Zion: the Emerald Pools Trail. 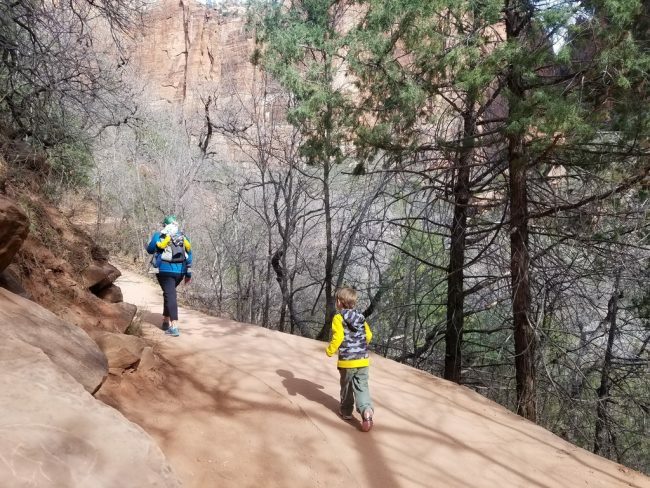 The Emerald Pools Trail makes a great first hike in the park with an easy incline and three major stops along the way that can work as endpoints of the hike. 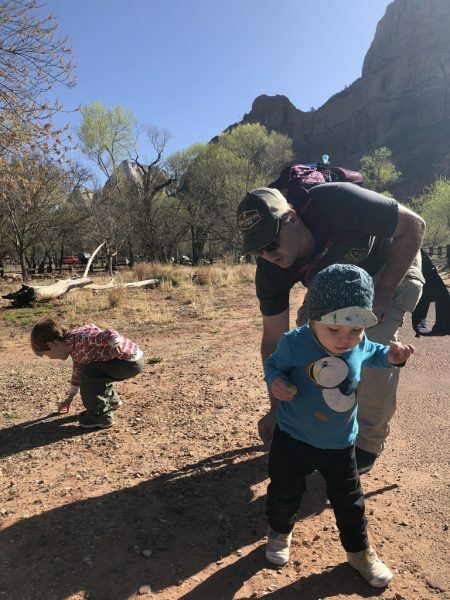 It had been a while since we had gone hiking with the kids, so we weren’t sure what to expect from our 3-year-old. Oscar walks a half-mile to preschool every morning, but we knew he’d tire out at some point and require carrying. To start, though, he was full of excitement and energy. 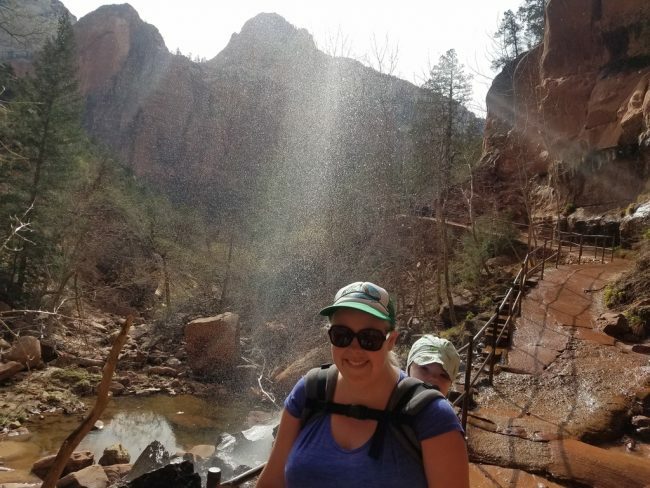 After a short walk (1/2 mile) we came to the first emerald pool, which was much less about the pool than the sprinkling waterfall you walk under and along. It was a unique and interesting spot, and the kids loved getting a spray of cool water as the day was starting to heat up. We continued along the path which was easy walking and mostly flat with some small inclines. Near the second pool we came upon some stone steps. We didn’t find the second pool to be overly impressive. At this point, our three-year-old decided he was done walking, so we chose not to continue up the steps to the final pool. Along the way down, we came to an offshoot path (possibly the Kayenta Trail) and followed it for a bit. After a very short way we came to a little slot canyon that was nice for a few pictures. 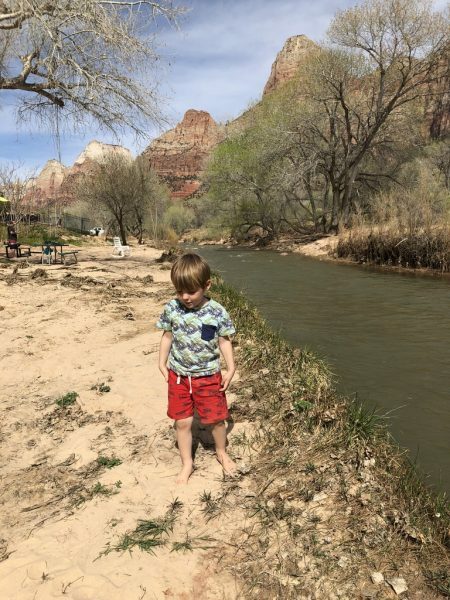 We decided to keep our first day short and took the shuttle back to our hotel for some outdoor play in the sand near the creek then went into Springdale for dinner. The next morning we got another early start and took the shuttle all the way to the 9th and final stop, the Temple of Sinawava stop. From there, the Riverside Walk is an easy, wheelchair-accessible path that runs along the river and ends at the start of the Narrows (a popular hike through the river). The Riverside Walk is mostly flat and is bordered by a short wall near any sizeable drop-off. Over millennia the river has carved its way down through hundreds of feet of sandstone. What remains are tall cliffs on either side of the riverbed. 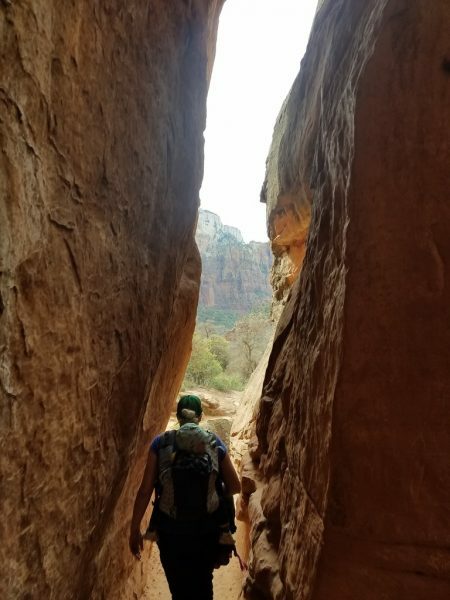 This short walk is definitely worth the trip for showing off incredible views from within the canyon. Around each corner was a new perspective. The canyon continually opened and closed before us while the sun’s angle either darkened or brightened the view. The Riverside Walk ends where the Narrows begins, and you may see people in full water gear walking in or out of the river at this point. 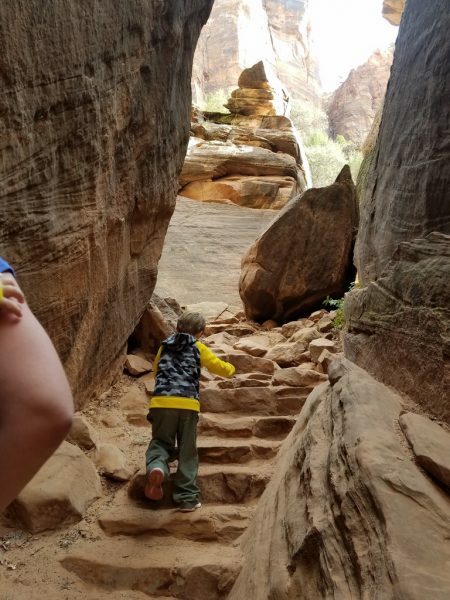 Older kids may be able to hike the Narrows and there is a place right outside the entrance to Zion that was constantly crowded with people renting gear for this more challenging hike. After the line to take the outbound shuttle, taking the return shuttle was straightforward. We hopped right on and went two stops to get to the 7th stop for Weeping Rock. Weeping Rock Trail is not so much a hike as a short staircase to a view. We found the “weeping rock” itself not very impressive after seeing a better version of this during our Emerald Pools hike. But the view from the top is worth the small effort to get there. Near the top, the rock wall starts to curve over you. The final view is looking out at a vista from something like a small cave. It was hard to capture it in a photo, but it is interesting to experience and a short stair climb to get there. 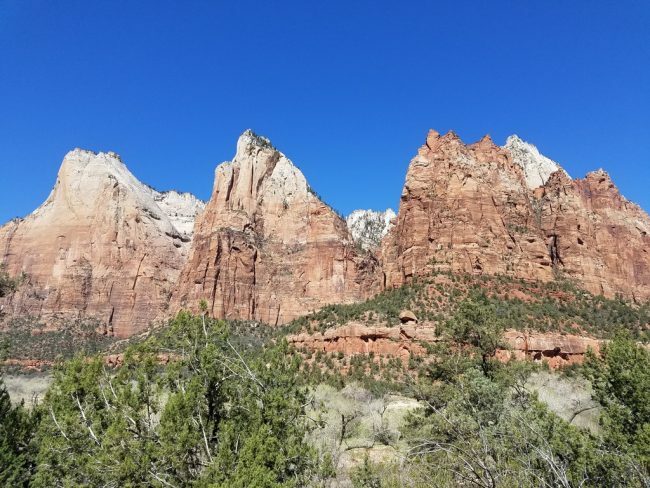 The Pa’rus Trail is almost an afterthought for most visitors to Zion, and for good reason! 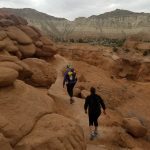 It is a wide, wheelchair-accessible path that is mostly flat and whose views are mostly the same as from the Zion entrance: far-off peaks and dusty, prickly bushes. 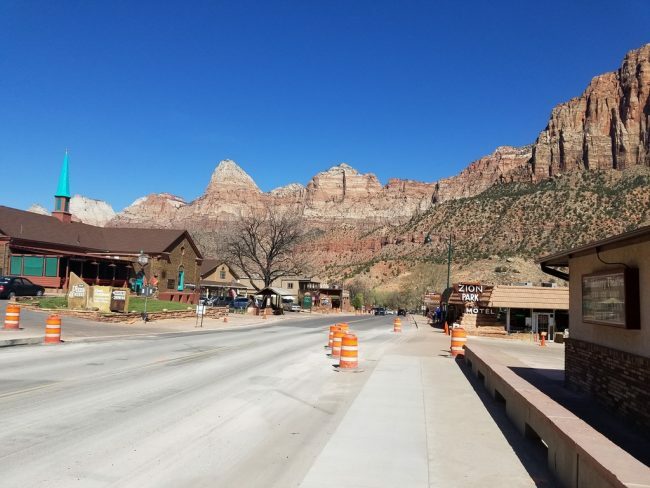 With the many dramatic views available in Zion, the Pa’rus caters more to visitors walking dogs or riding bicycles. There was one feature that made Pa’rus enticing to us: no wait! We got a late start the next morning (around 10 am) and saw the shuttle line snaking all the way back to the parking lot. Rather than standing in line for at least an hour and a half, we decided to walk the 1.7 mile Pa’rus with the hopes of squeezing on a shuttle at its end point. 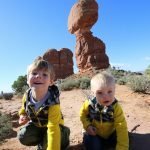 Travel with kids can be frustrating at times but we always try to roll with the punches. Our boys spent about a half an hour picking rocks along the path before we really started moving. One nice thing about the Pa’rus was it’s emptiness and openness. There were people there but it was much less crowded than the more popular hikes. It was also wide and safe for our 3-year-old to run freely along most of the path. 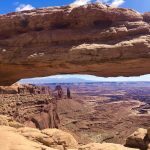 We had an unwelcome discovery when we finished our hike and got to the 3rd stop of the shuttle route at Canyon Junction. Two outbound shuttles in a row were full and we weren’t able to get on. Defeated, we decided to board an inbound shuttle back to the entrance. That is when we discovered the secret of the 2nd shuttle stop, the Museum stop. When you board the shuttle at the entrance to Zion they fill all the seats then depart. The shuttles leave standing room available for anyone boarding further along the route. We weren’t able to get on at the 3rd stop because all the standing room had been taken by people at the 2nd stop. How did people get to the 2nd stop? They walked halfway up the Pa’rus Trail to do it. The Pa’rus Trail ultimately ends at the 3rd shuttle stop but there is a signed offshoot trail to the the Human History Museum. Since the museum wasn’t open when we were there, the only reason to anyone went to the 2nd stop was to board the shuttle and skip the huge line at the entrance. 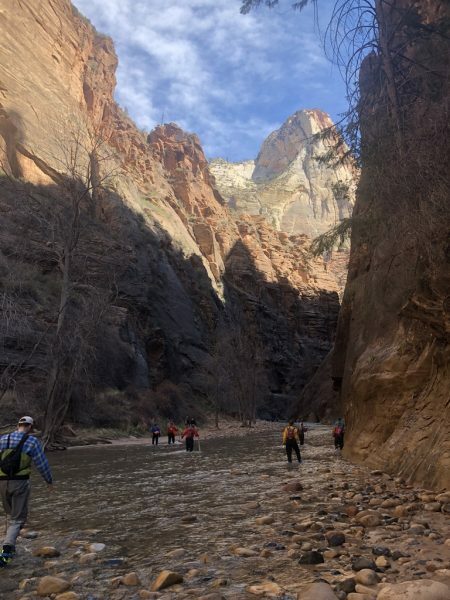 So after walking to the 3rd stop then shuttling back down to the 2nd, we waited for just 10 minutes in a short line to take the shuttle back up to the 5th stop to have lunch at the Zion Lodge. The Lodge is worth a stop for the ambience alone. 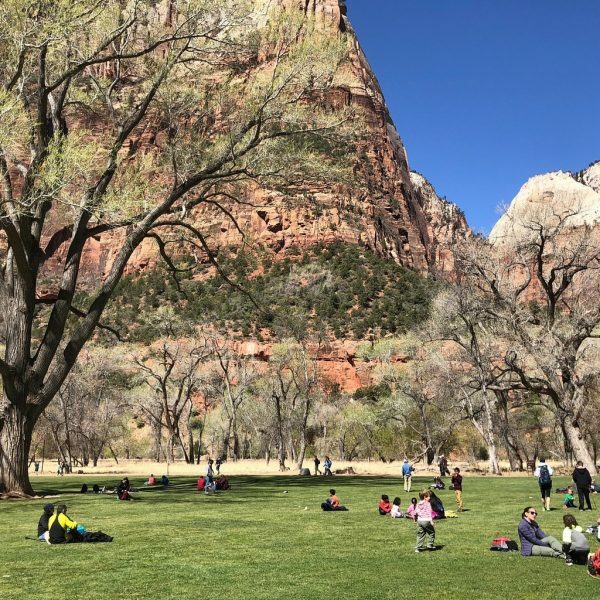 The wide lawn has the feel of a college yard while Zion’s many peaks sprout up around you. On our way back to the entrance we stopped at the Court of the Patriarchs, one of Zion’s most famous sights. The 1 mile long trail was closed, but we were able to take a short walk up to the viewpoint to see the three famous peaks. 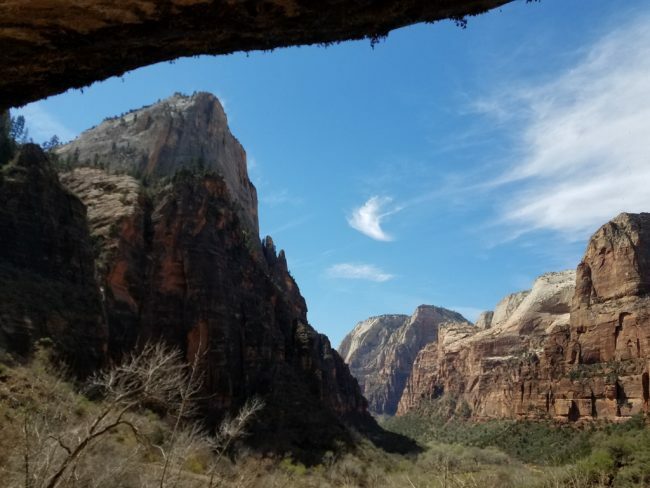 The view was nice but we felt the cliffs of Zion were more impressive when we could walk alongside them on hikes. We took the shuttle the rest of the way down to the entrance and decided to change gears and spend our last afternoon exploring Springdale. 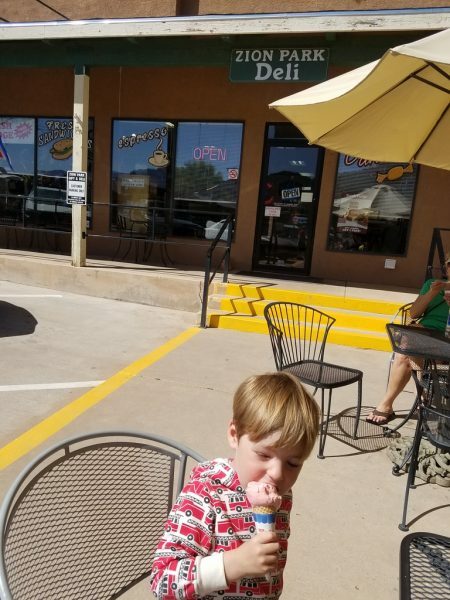 Oscar enjoyed a well-earned ice cream cone and we wandered through the many shops peddling Zion-branded t-shirts and hats. 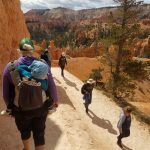 On to the next stop of our hiking trip through Utah: a visit to Bryce Canyon National Park!